Rain seems to fall on cue this summer. I've only turned on the soaker hoses two or three times, since a weekly downpour does the job for free. Compared to the last few summers, when temperatures reached 100 degrees for days on end, this feels like an aberration. Leaner, hotter, drier times are likely in our future. During periods of drought, daily watering becomes expensive. Municipalities may restrict water use. Plants we've spent years cultivating may be lost in a single season. 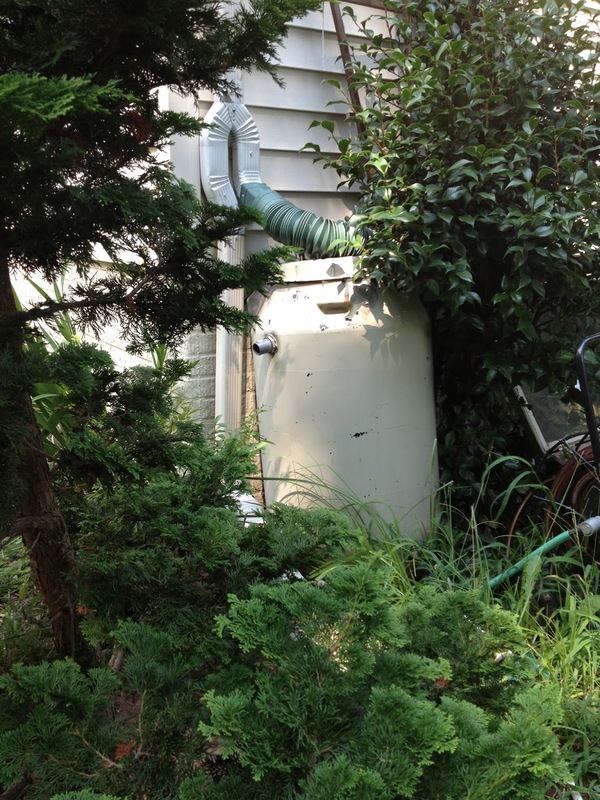 So why not take some of the money saved on water bills this year and invest in a rain barrel? Rain barrels capture rainfall from downspouts and store it for later use. They also help prevent storm water run-off, erosion, and watershed pollution. Rain barrels come in many shapes and sizes, and may be very expensive, or quite reasonable. We installed three rain barrels around our house, two of which I made at a Fairfax County rain barrel workshop. After a presentation on how to build, install and use the rain barrels, participants go outdoors to assemble them. If you've never seen the inside of a pickle vat, this is a rare opportunity to get in touch with your inner vinegar-loving self. To attach the spigot to the base of the rain barrel, workshop participants climb inside and make quick use of tools. Mesh tops are attached to prevent debris and insects from entering. There are plenty of staff and volunteers on hand to help. For those less inclined to make their own, the County offers pre-made rain barrels for sale. 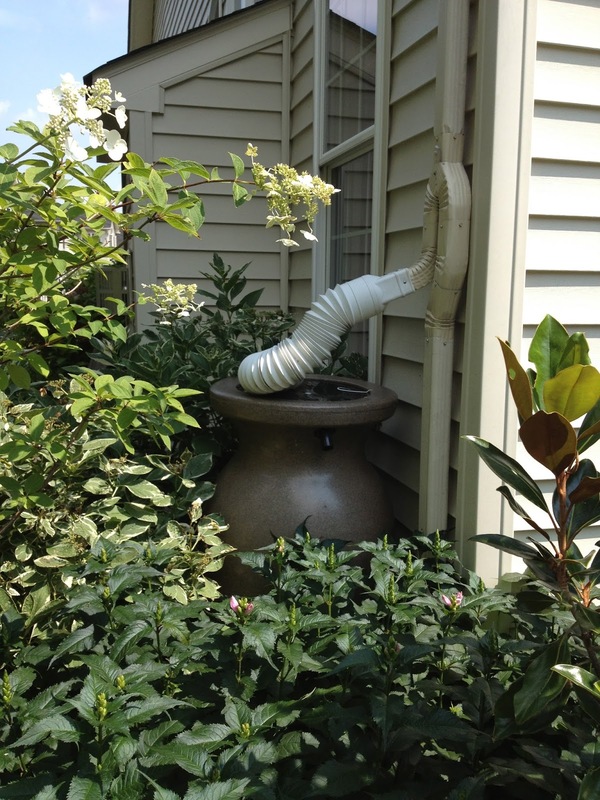 Once at home, it's easy to install a downspout diverter, which allows you to control the water flow. When the barrels are full, simply flip the switch to direct water toward the ground. With a hose connected to the rain barrel spigot, it's easy reach plants throughout the garden. Using bricks to elevate the rain barrels helps increase water pressure. We use mosquito dunks in the barrels, though the mesh screens also prevent some reproduction. 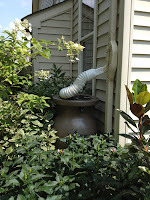 Because gutters may contain pollutants from birds and debris, we do not use rain barrels to water the vegetable garden. We chose to incorporate our rain barrels into the landscape by spray painting them a neutral tone, but more artistically inclined barrel owners create beautiful garden accents. The Northern Virginia Rain Barrel program worked with artists who decorated rain barrels for local libraries and schools. Click above to read about the artists and see their creations. To register for upcoming rain barrel workshops or purchase one at a distribution sale, check the Fairfax County website. Saturday, August 24, 10:00 a.m. - 12:00 p.m.
Wednesday, September 25, 6:30 - 8:30 p.m.
What a great idea to make your own rain barrels. Due to 100 year old water rights, we in Colorado can't collect rainwater but we all wish we could! Nice post.